India on Monday launched five foreign satellites from France, Singapore, Germany and Canada on board the PSLV-C23 rocket. 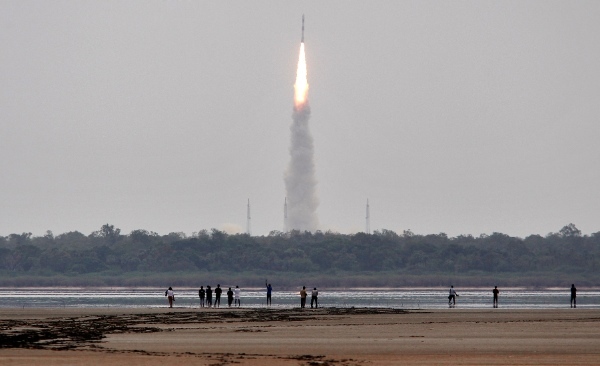 Indian workhorse Polar Satellite Launch Vehicle PSLV-C23 placed all five satellites into their intended orbits, one after the other between 17 and 19 minutes after liftoff, in textbook precision, said the Indian Space Research Organisation (ISRO). “Truly this is a global endorsement of India’s space capability,” said Indian Prime Minister Narendra Modi who witnessed the launch. French satellite SPOT 7 would form part of the existing Earth observation satellite. European space technology company Airbus Defence and Space has built SPOT-7. Germany’s AISAT satellite would focus on the global sea-traffic monitoring system with special emphasis on high traffic zones using AIS signals. India has so far launched 35 satellites from 19 countries around the globe — Algeria, Argentina, Austria, Belgium, Canada, Denmark, France, Germany, Indonesia, Israel, Italy, Japan, Korea, Luxembourg, Singapore, Switzerland, The Netherlands, Turkey and United Kingdom, bringing a huge sum to the country as foreign exchange. India is keen to boost its share of the global commercial space-launching business but the cost-efficient advantage of Indian rockets has been overshadowed by the achievements of rival Japanese and Chinese aerospace industries, as well as private aerospace enterprises from Europe and the US. Meanwhile, BRICS member Russia continues to be the world champion in the space launch market, according to Russian federal space agency Roscosmos, although it has suffered a spate of rocket crashes in recent years. The US uses Russian Soyuz rockets to send astronauts to the International Space Station (ISS) and uses Russian rocket engines in Pentagon satellite launches.